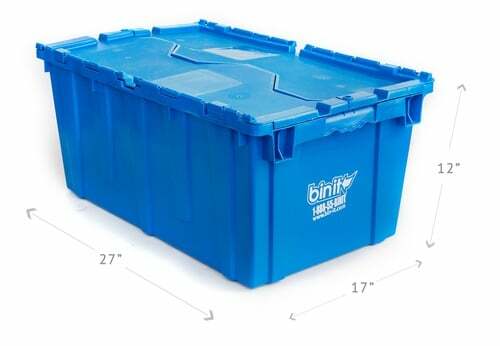 Bin-It plastic moving bins are affordable and cost-effective. They are 25% cheaper than buying cardboard boxes. Free Delivery & Pickup. 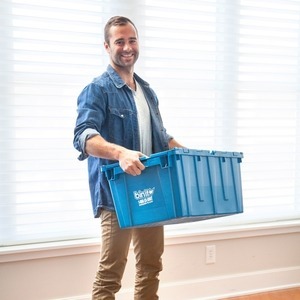 We deliver the bins when you need them and pick up the empty bins when you’re done. Free zip-ties and labels with each order that secure and organize your items during transit and organized when you’re unpacking room-by-room. Our bins are sanitized after every use. 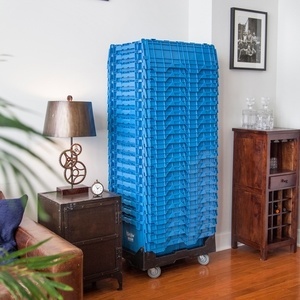 We make sure that each customer receives a fresh set of bins, so you can pack your clothes, bedding, and pillows with peace of mind. We provide real-time notifications for your delivery or pick up. We inform you at every step of the way in real time, from door to door, where your bins are. You won't have to guess when we'll show up - you'll be able to see it. Lastly, we care about you. We know how stressful moving can be and we will go that extra mile to make your move as smooth as possible. 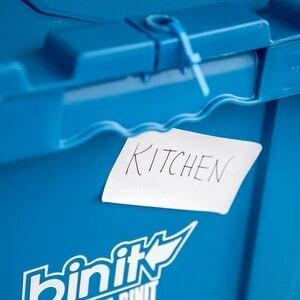 Thank you so much for visiting our website, we know you're going to love Bin-It bins. Give them a try for your next move. Bin It bins are all the same size keeping things simple and easy to carry when they're full. Bin-it zip ties and labels keep your stuff secure during transit and organized when you're unpacking room-by-room.